A Karaite author, who flourished in the first half of the eighteenth century. 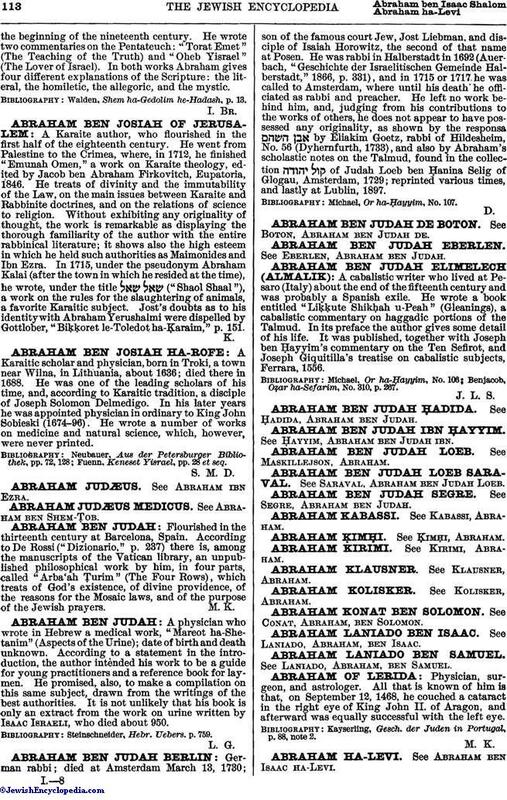 He went from Palestine to the Crimea, where, in 1712, he finished "Emunah Omen," a work on Karaite theology, edited by Jacob ben Abraham Firkovitch, Eupatoria, 1846. He treats of divinity and the immutability of the Law, on the main issues between Karaite and Rabbinite doctrines, and on the relations of science to religion. Without exhibiting any originality of thought, the work is remarkable as displaying the thorough familiarity of the author with the entire rabbinical literature; it shows also the high esteem in which he held such authorities as Maimonides and Ibn Ezra. In 1715, under the pseudonym Abraham Kalai (after the town in which he resided at the time), he wrote, under the title ("Shaol Shaal"), a work on the rules for the slaughtering of animals, a favorite Karaitic subject. Jost's doubts as to his identity with Abraham Yerushalmi were dispelled by Gottlober, "Biḳḳoret le-Toledot ha-Ḳaraim," p. 151.